Shocking, but true… there are indeed waterfalls other than the man-made wonders on the Strip. This must be Las Vegas’ best kept secret. I found myself lounging on a rock at stream’s edge, munching on cheese and veggies, and surrounded by the unmistakable whoosh of a cascading waterfall. 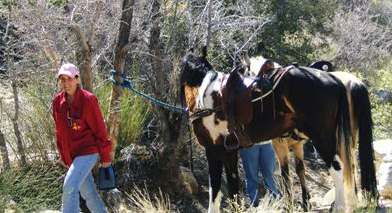 Three horseback riders arrived, tethering their steeds to a nearby bush and completing the pastoral setting. First Creek Trail is in Red Rock Canyon National Conservation Area only 20 miles from the Las Vegas Strip, but a world apart. To reach the hidden creek and waterfall, it is NOT necessary to pay the entry fee and join the crowds along the 13-mile scenic drive of Red Rock. Instead you can drive less than three miles beyond the Visitors’ Center entry to the First Creek pullout. The sheer cliffs are stunning — red sandstone layered with gray limestone. Winter or spring is best for this hike, as the waterfalls are seasonal and the temperature is comfortable for hiking. The sand crunched beneath our feet as we started down the trail through the flat, dry desert. Cactus grew randomly throughout the landscape, some with spines too near the trail for comfort. Those spines are miserable to pull out, and can sting for hours. The sky was blue with nary a cloud. Ahead was our destination, marked by tall, sheer cliffs shimmering in layers of red and gray. The air was exceedingly dry, especially to my Pacific NW sensibilities. Even in March, the sun was already promising baking temperatures. The silence was broken by the unexpected chirp of a small songbird drawn by the line of stunted trees ahead which promised some sort of water source. Other than this stray bird, we had the trail all to ourselves. As we drew near the trees, we heard a strange sound — unexpected in a desert — the unmistakable gurgle of running water. The gurgle led us to a small stream surrounded by boulders — the perfect perches for enjoying the comfort of the water-cooled air. This is a desert hike. Bring sunscreen, water, and a light picnic if you’re so inclined. The trail (approximately three miles round trip) leads to the mouth of First Creek Canyon across open desert, with a bit of rock scrambling required to reach the creek and falls. Kids as well as adults will love this — especially if you spot the elusive desert bighorn, or even one of the wild burros that frequent the area. There are no services at the trailhead. There are restrooms just north of the pullout, prior to reaching the Visitors’ Center. W Charleston Blvd./NV-159 from the city to Red Rock; First Creek Trailhead is signed.